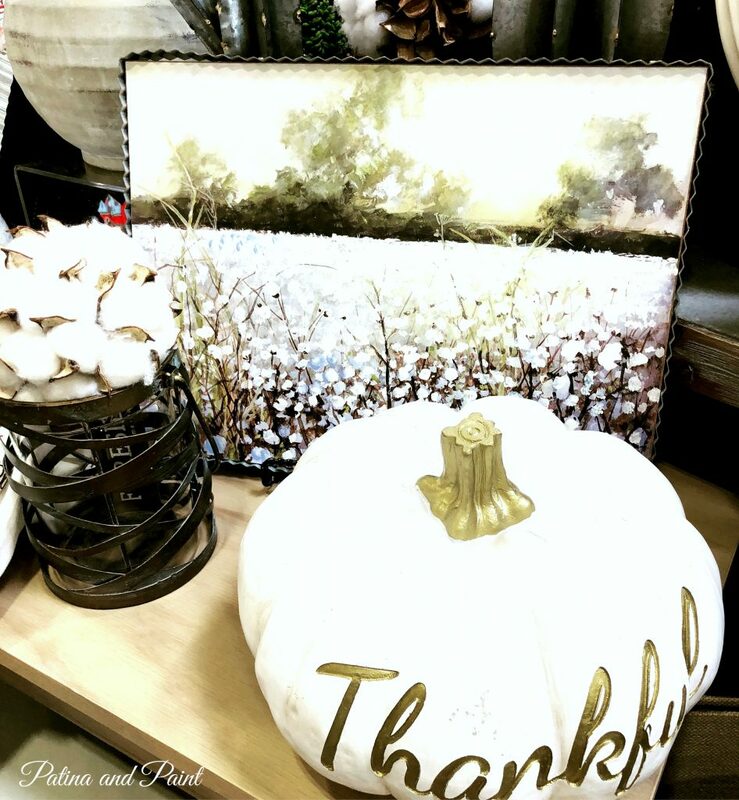 Lately I have been so blessed to be able to paint a few projects for my family. I truly love being able to do that – it is so darn fun! 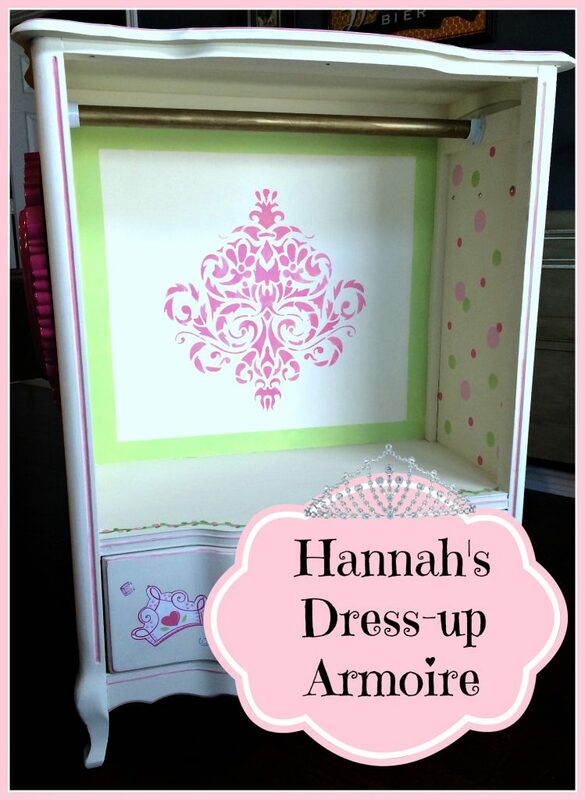 I can’t wait to share with you Hannah’s dress-up armoire. 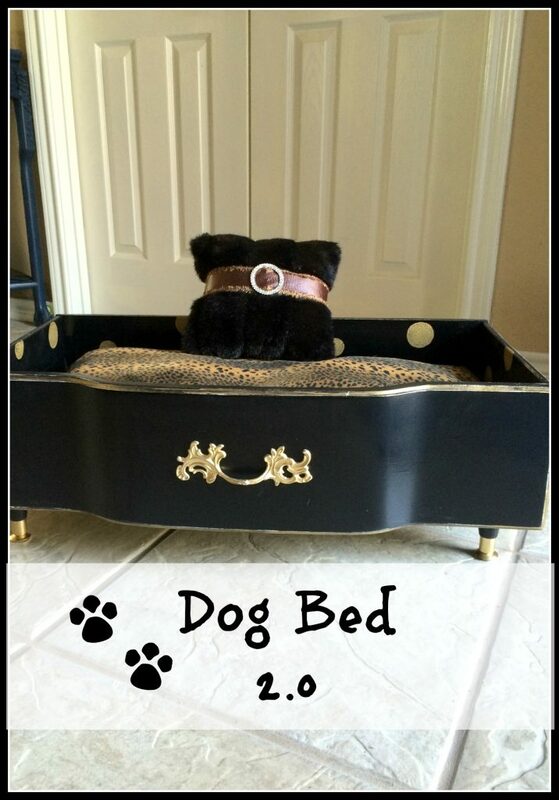 If you saw my last post about Diva Dog Beds, you know that my friend Shelli gave me this really cute dresser. Score! This was a great dumpster find. After talking with our niece Rachel, who told me that she needed storage for her daughter Hannah’s dress-up clothing, I knew that this would be the perfect piece for that. So grab a drink and sit back while I show you the before (above) and after! After removing all drawers and the drawer guides except for one, the amazing Hubs built in a shelf above the bottom drawer. As you can see we left one drawer because a princess needs a place for her crowns, glass slippers and jewels! Duh! 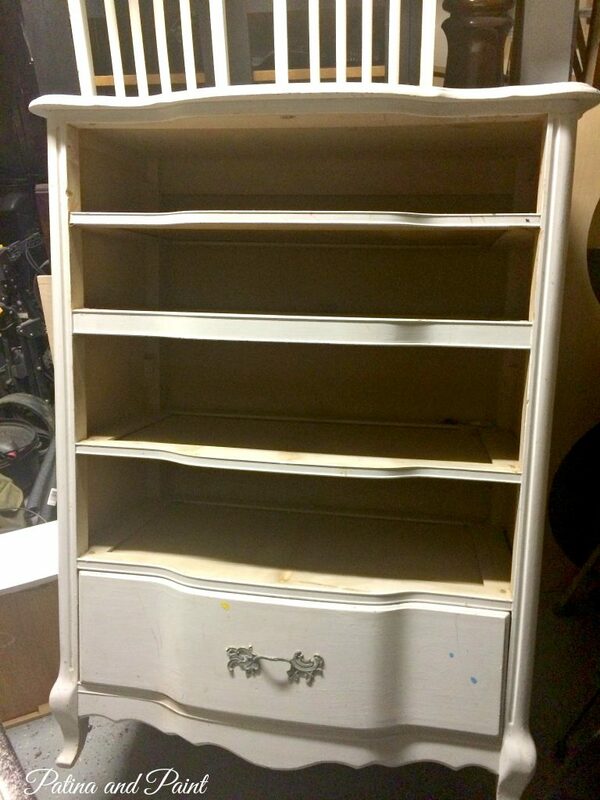 A couple of coats of cream paint and then the fun painting began. 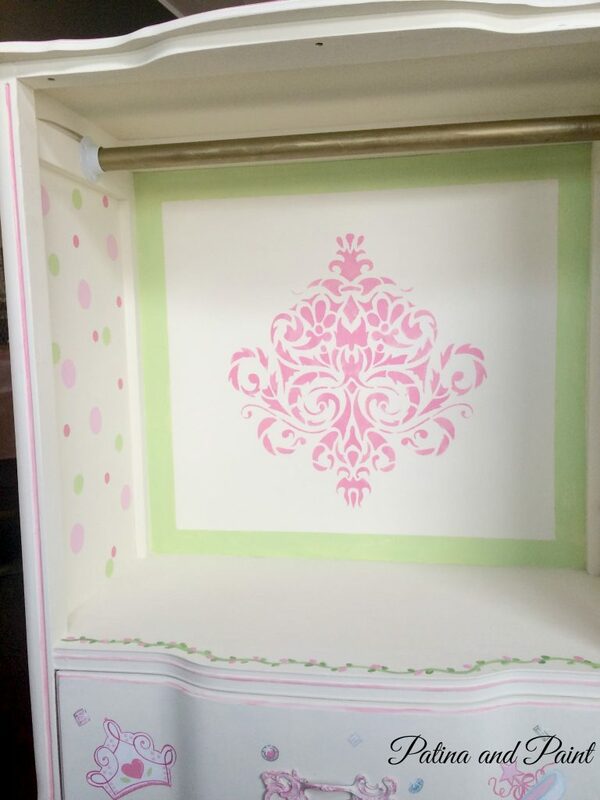 On the inside of the armoire a large damask medallion on the back is the focal point – so girly!!!! Polka-dots in three different colors flank either side. 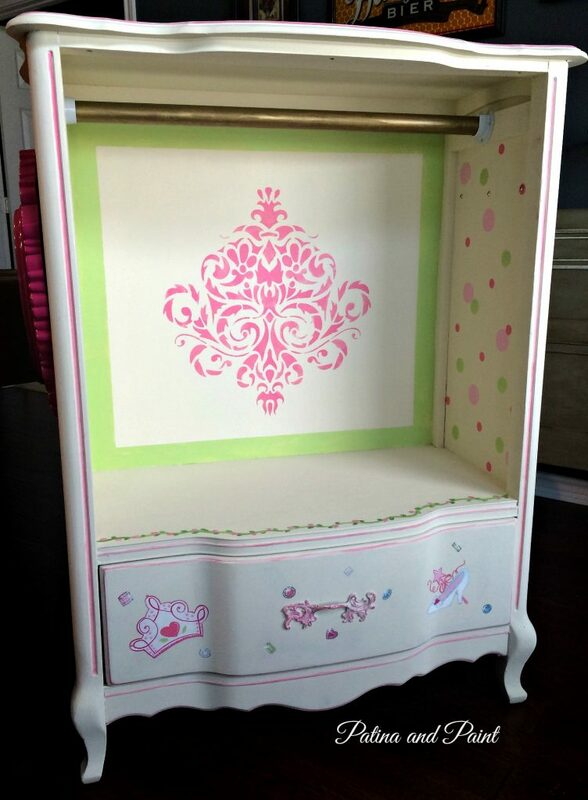 The hanging rod was painted gold because a princess has to have a little bling! 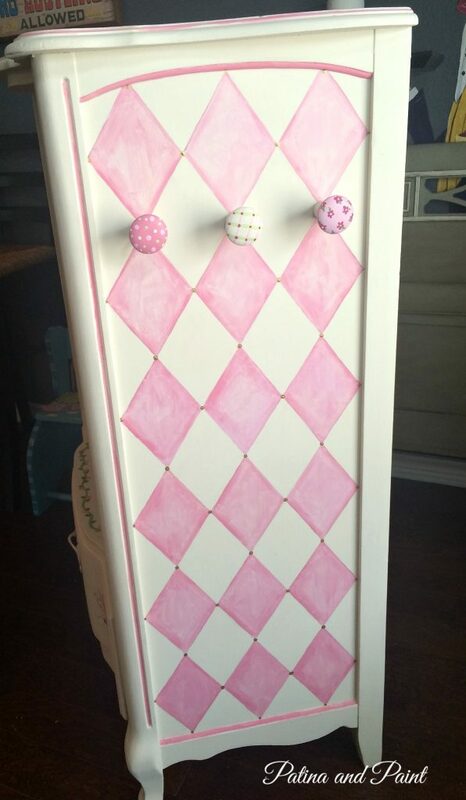 I took old drawer pulls and mounted them onto dowel rods to make hooks that were mounted on one side of the armoire. Can’t you just see boa’s and necklaces hanging here? And what princess can live without “a mirror, mirror on the wall?” Love, Love, Love this mirror! 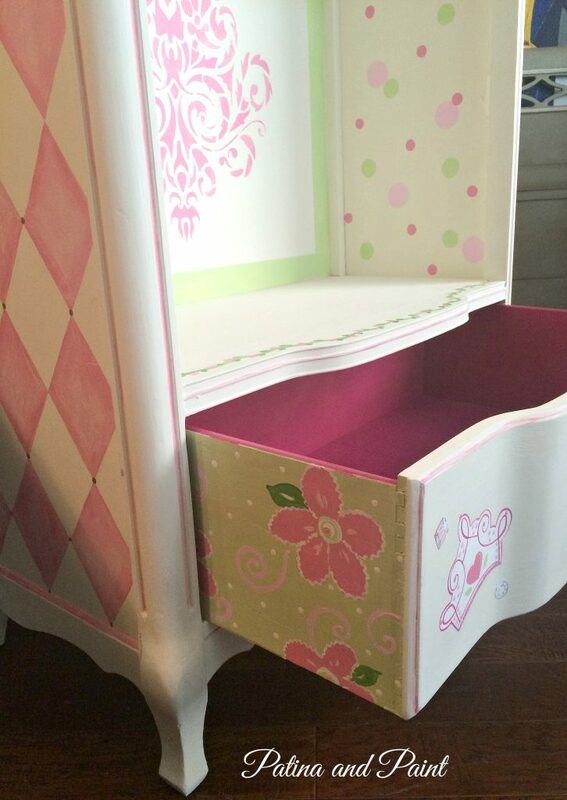 When the princess opens the drawer to get her glass slippers and crown she has to look at something pretty, so we painted the inside of the drawer a dark pink. The sides got a flower “wallpaper” treatment. 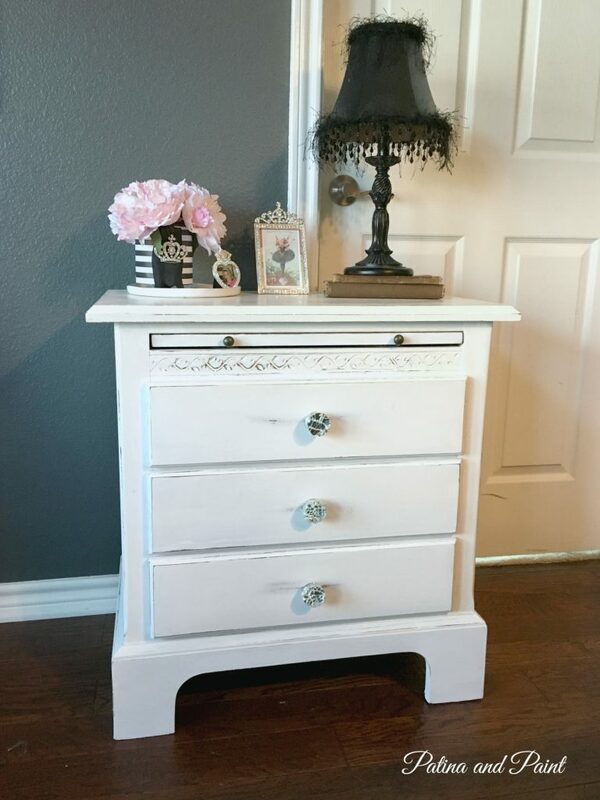 Even the Queen would love such pretty drawers! 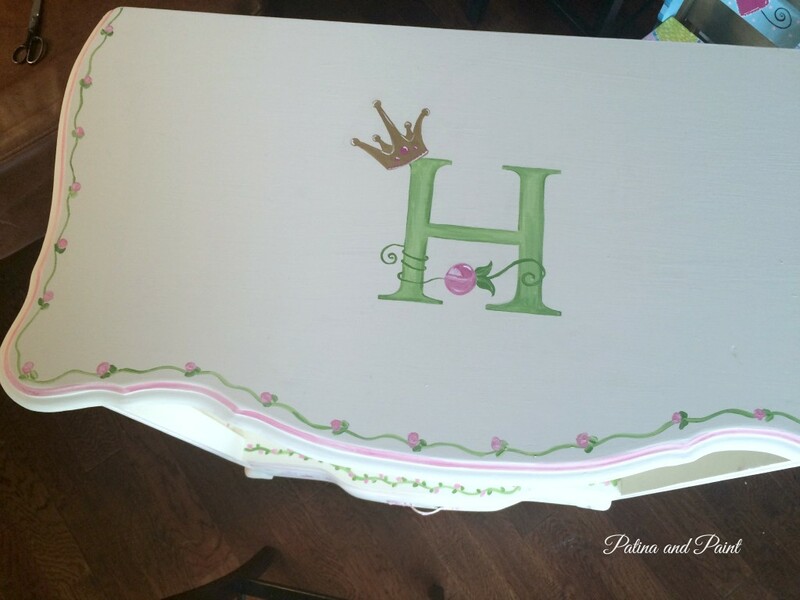 And last but certainly not least we painted Princess Hannah’s royal crest on the top of her armoire. A sweet floral garland around the edge finishes the top off. 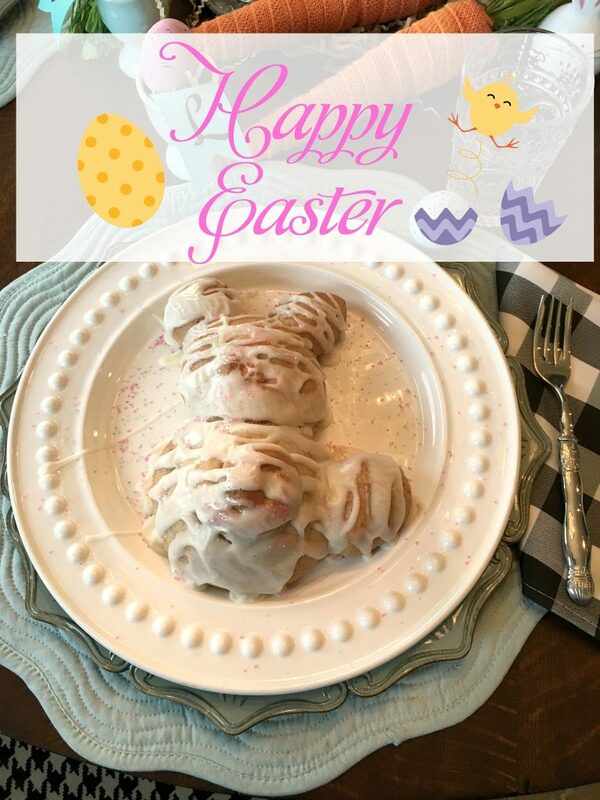 Simple and sweet. There you have it… even I can’t believe the before pictures compared to the after ones. 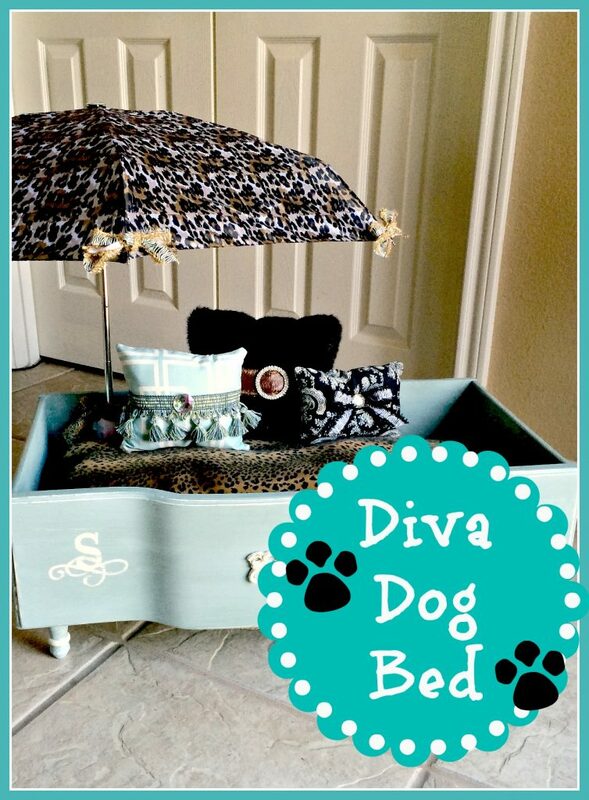 I’m not gonna lie, this took a little time to paint, but I believe the after pictures prove that it was worth it. Now if Princess Hannah loves it as much as I do then I will be on cloud nine!